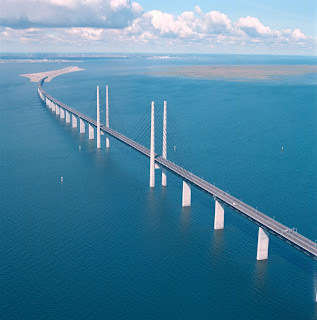 "This Girl is Hungary": Lund, Sweden via a Really Long Bridge and Underwater Tunnel Through the Sea… and Copenhagen. Lund, Sweden via a Really Long Bridge and Underwater Tunnel Through the Sea… and Copenhagen. So my trip was full of exciting things to fill a facebook photo album full of funny pictures of interesting things. Too bad for you facebookless folks. I will post pictures here as soon as I narrow it down to under 350 pictures. (When I travel alone I apparently become my Uncle on my Dad’s side – you know who you are… you take a lot of photos). 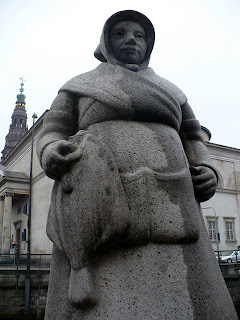 I got to Copenhagen completely unprepared as I had no time/was too lazy beforehand to decide what to do there. I knew there was a brewery, a mermaid and interesting fish products. In my opinion it was all you really need to know. I got lost upon arrival and the biggest shock for me is that when asking someone on the street where I was they were polite to me, in ENGLISH (Chalk one up for Copenhagen). A cab driver even got out of his car to point me in the right direction… Speaking of cars, there were only like a handful in the entire city. Everyone bikes and walks, and most of the centre is walking streets. Do you know how lovely that is? It is really lovely. I spent the next day in the national museaum because it was raining and FREE (That is two more points for Copenhagen). 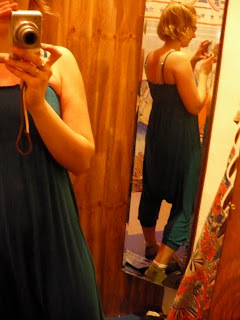 I then decided to wander through the centre city and ‘shop’… It was too expensive to actually buy anything though. 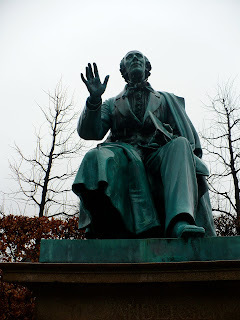 -Another statue of H.C. Andersen... Not pictured: Mr. Andersen. 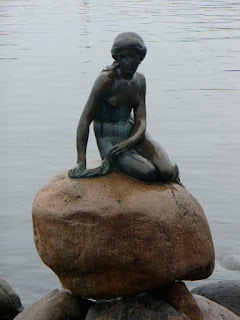 The next day it was pouring rain but I was bound and determined to find the Mermaid on foot. I had eaten really delicious cake the night before so it was probably one of those moments where I thought that by walking across a city in the pouring rain might be a good idea for my thighs. I rarely think like this. Two and a half hours later the fine specimen and I finally met and she didn’t even come off from her perch to say hello. I also saw a dead bird. -Still trying to convince myself you were worth it, young lady. Soaking wet, having not eaten, and tired from walking I decided that perhaps I should take the train to my next destination - Lunch. On the train I changed my plan and went directly to the Carlsberg Brewery. Now, we all know how I can “be” without food so you can probably imagine my mood at the time. The brewery is poorly located and because I didn't want to ask for help i ended up walking though a construction site and actually had to jump a fence to get out. (I made that sound more interesting than it was. In reality I stepped over a fallen fence). Anyways the brewery was slightly interesting. I saw barrels and hops and horses! The most important part was that with the fee of entrance (wow – this is what speaking English in Hungary does to you) you received two free beer (I think that brings Copenhagen up to four points). Now, free beer amoung friends, people you kinda know, random other lonely people from the street is fun. Free beer alone, on an empty stomach is awkward. It is sort of like eating alone but thirty times worse. The Carlsberg Brewery was kind enough to have free wifi access so I facebooked on my ipod to feel less stupid - though I probably still looked just as pathetic. I am a stronger person for living through this, I feel like I have the confidence to drink alone in public anytime now. I met up with work folk and we took the train to Lund, Sweden. This is where things start getting interesting - architecturally speaking. – That bridge is so intense.. And then all of a sudden the train goes into the water! Dive Dive Dive! -Semla: all that cream is hiding the almond paste. -Not the most aptly named chocolate bar when translated into English. 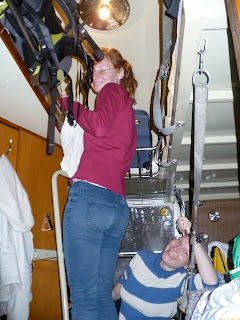 -This picture doesn't really do the place justice... You can't see the floor, our tiny fold down chair or the bottom bunk. THREE PEOPLE in that room. THREE!!!!! Advice: Only stay there with a sense of humour and nice people. All in all it was great trip and since then I have been working, working and working. Easter can't come soon enough.